By CCN.com: The Dow quivered throughout much of Thursday’s US trading session after a vindictive President Trump unleashed a savage scatter-shot tweetstorm directed at his political enemies. 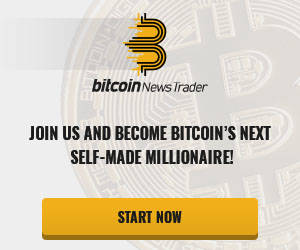 The cryptocurrency market, meanwhile, remained rigid as bitcoin traders begged for something to catalyze a breakout. The Dow Jones Industrial Average recovered from a tepid pre-market session to surge more than 100 points shortly after the opening bell, but the index began to slide just minutes later. By early afternoon, it had fallen back into the red, after which it once more began to edge higher. As of 3:20 pm ET, the Dow had gained 74.58 points or 0.29 percent to rise to 25,700.17. Wall Street’s other major indices made small advances as well, with the S&P 500 climbing 0.28 percent to 2,813.28 and the Nasdaq adding 0.28 percent to reach 7,664.86. On Wednesday, a volatile Dow ultimately dropped 32.14 points or 0.13 percent, despite surging to triple-digit gains immediately after the opening bell. 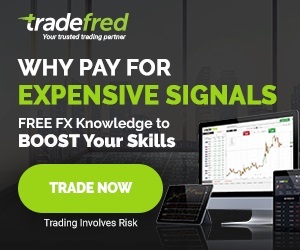 The Nasdaq and S&P 500 fared even worse, with the former shedding 0.63 percent and the latter careening down 0.46 percent, leaving it just 5.37 points above the crucial 2,800 level. One would expect that Wall Street would be mashing the buy button this morning following a blockbuster report that US and Chinese negotiators had made massive progress toward overcoming crucial hurdles that have prevented the two economic superpowers from sealing the deal on a new trade agreement. According to Reuters, China made “unprecedented proposals” on several issues, most notably the thorny issue of intellectual property. Instead, index prices are hovering around their previous-day closes, suggesting that other factors are spooking traders heading into the week’s penultimate trading session. That may be because Wall Street is grappling with a newly-emboldened Donald Trump who on Thursday unleashed a savage shotgun-blast of tweets aimed at a cavalcade of his political enemies, both foreign and domestic. The president began his morning social media routine much like any other, tossing rhetorical daggers at the “Fake News Media” who are suffering a major “breakdown” and have “never been more corrupt than it is right now.” He later lobbed a targeted insult at MSNBC’s “Morning Joe,” gloating that its ratings had “tanked” since Attorney General William Barr indicated that the Mueller report had failed to establish that he or anyone associated with his 2016 presidential campaign had engaged in any criminal wrongdoing related to Russia’s interference in the election. He then turned his attention back to Mexico, which he alleges is doing “NOTHING to stop the flow of illegal immigrants” into the US. “May close the Southern Border!,” Trump warned. That’s when things began to get more interesting. First, Trump revealed that the FBI and Department of Justice would review the “outrageous” Jussie Smollett case, which saw the “Empire” star walk away virtually scot-free despite allegedly faking a hate crime. “It is an embarrassment to our Nation!,” he complained. At last check, Trump had begun to wade into the financial markets. 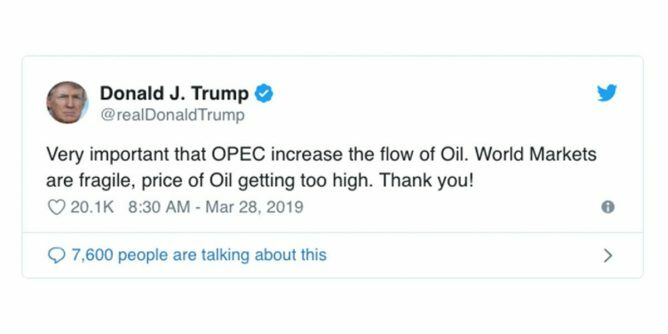 Alleging that “World markets are fragile,” the president warned that it is “very important” that OPEC ramp up oil production to ease up pressure on prices. Crude dropped $0.05 or 0.08 percent on the day after flashing declines of more than 1.5 percent earlier in the session. While Wall Street has by now become accustomed to Trump’s trigger-happy Twitter thumbs and early-morning tweetstorms, it’s understandable that traders would proceed with caution until the tweetclouds had past. The cryptocurrency market, meanwhile, continues to trade sideways inside a tight window while investors wait to see whether the bitcoin price has enough momentum to catalyze an upward push past resistance at $4,200. Optimists allege that a strong push past this mark would initiate a new bull market, but bitcoin bears point to declining trading volumes as one of several factors that should make investors hesitant to buy into the rally. For now, the bitcoin price is holding at $4,024, representing virtually no change over its previous-day level. Most other large-cap cryptocurrencies remain uncomfortably quiet as well, though EOS – which just recently broke above its 200-day moving average – added another 4.27 percent to its already-impressive rally to climb to $4.27.